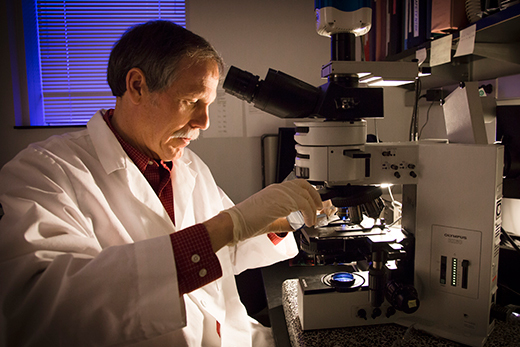 Someday, if women toast the discovery of male oral contraceptives, they may want to lift a glass to Emory biology professor Steven L'Hernault and his worms. L'Hernault, chair of Emory College's Department of Biology, researched sperm proteins (not male hormones) in nematode worms. He and fellow researchers were able to establish a connection between fertilization in mammals, including humans, and nematodes. It was a highly unexpected outcome, given the two animal groups last shared a common ancestor about a billion years ago. The conclusion, which some think could eventually lead to the equivalent of "the pill" for men, provides new insights on the basic mechanics of sperm and egg fertilization. It was recently reported in the journal Current Biology. "At the end of the day, fertilization in humans seems to share some fundamental features with fertilization in worms," L'Hernault says. "Specifically, a similar protein is found on the sperm surface in humans and worms and, if a drug could be discovered that interfered with its function, we might be able to prevent sperm from fertilizing the egg. "The worm may offer an inexpensive way to find such a drug," he adds. "Women have borne more than their fair share in that category of contraception, so the idea is to look at what might be possible for men." In mammals, such as mice and humans, this protein is called Izumo, named for a shrine in Japan where newly married couples visit seeking luck in having children. The Izumo equivalent in worms, named SPE-45, allows the sperm to be recognized by the egg, so that fertilization can occur. Without it, the sperm can move and do other processes normally, but they cannot fertilize the egg. Worms with a mutation affecting SPE-45 are sterile. If you do "gene therapy" by expressing the worm SPE-45 protein in mutant worms, fertility is restored. The challenge was to show that mammalian Izumo was functionally similar to SPE-45. L'Hernault says that he and his team of researchers worked for seven years, focusing on whether there was something specific that connected the two that allowed for fertilization. Both SPE-45 and Izumo proteins have an Ig region that probably allows the sperm to adhere to the egg. Ig regions are widely found in many proteins of all animals, where they provide "stickiness" to proteins. So, L'Hernault and his team took the Ig region from the mouse Izumo protein and used it to replace the Ig region in the worm SPE-45 protein, making a "hybrid" protein. Surprisingly, this "hybrid" protein can be expressed in a worm SPE-45 mutant and it will partially restore fertility to the worm SPE-45 mutant. In contrast, if the Ig domain from a worm skin protein is used to replace the Ig domain of the worm SPE-45 protein, this "hybrid" does not restore fertility. In other words, not any Ig domain, with its associated "stickiness," will allow SPE-45 to fertilize an egg. It must be either the natural worm SPE-45 Ig domain or the Ig domain from a similar mammalian gene. "One useful way to think about Ig domains is that they are all keys and, like real keys that look similar, some specifically open your house, while others only open your car," L'Hernault says. His research shows that the mouse Izumo and worm SPE-45 Ig domains are near-identical "keys." All animals produce sperm that stick to and fertilize eggs from that species, but, generally, sperm from one animal cannot fertilize eggs from another species. That means L'Hernault's work extends well beyond any potential connection to birth control and could provide more understanding on the basic underpinnings of fertility. "Knowing how sperm stick to and fertilize eggs will provide key insights into what has changed and what has remained similar as animals have evolved," L'Hernault says. In addition to L'Hernault, the team and co-authors of the paper came from his lab and include Hitoshi Nishimura, Tatsuya Tajima, Heather Skye Comstra and Elizabeth J. Gleason.